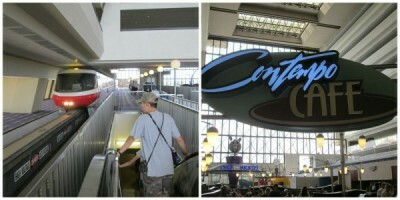 The Contempo Café in Disney’s Contemporary Resort is our favorite Walt Disney World resort food court. 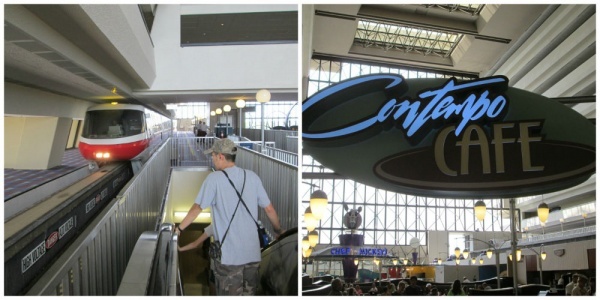 Two nice things about the Contempo Café are that you do not have to be staying at the Contemporary Resort to eat there and it’s only a short monorail ride away from the Magic Kingdom! 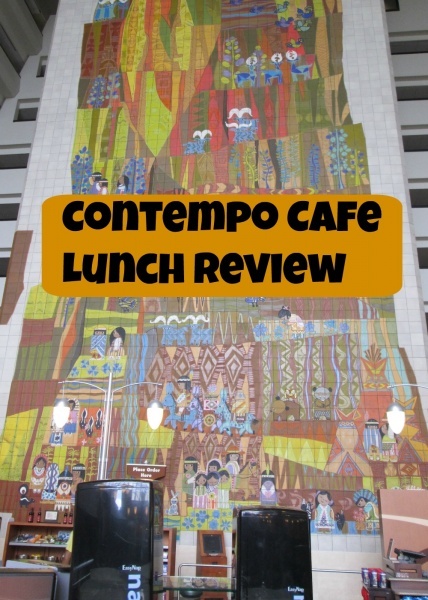 In fact, we schedule a Contempo Café lunch break on a Magic Kingdom day to enjoy good food in a nice atmosphere while also getting a break from the heat and crowds of the Magic Kingdom. Getting there via monorail is half the fun! The seating area overlooks the huge Mary Blair mural (Ed. Note: Mary Blair was an infamous Disney artist and Disney Legend) at the Contemporary Resort and you can watch the monorail come and go as you eat. What a great atmosphere! I like the open space here, and the Mickey chairs are a nice touch! The flatware, beverages, and napkins are easy to find. 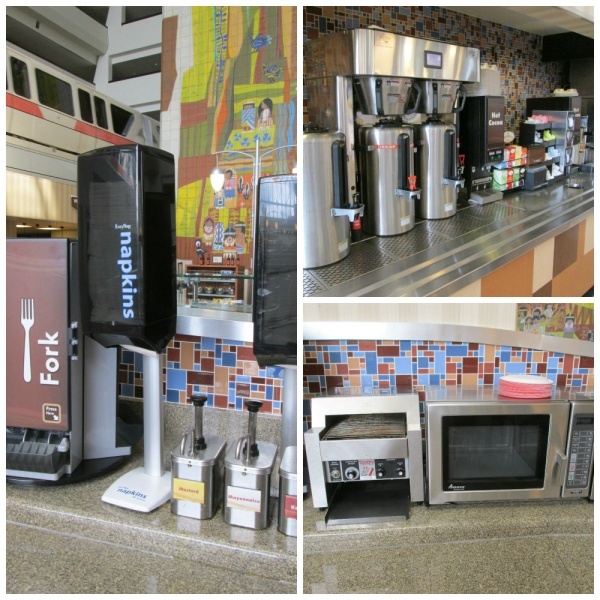 The microwave and toaster are handy if you are staying at the Contemporary Resort and wish to use these items. The main courses of food are ordered on a touch screen, which is efficient and quick. You get a buzzer to let you know when your food is ready. 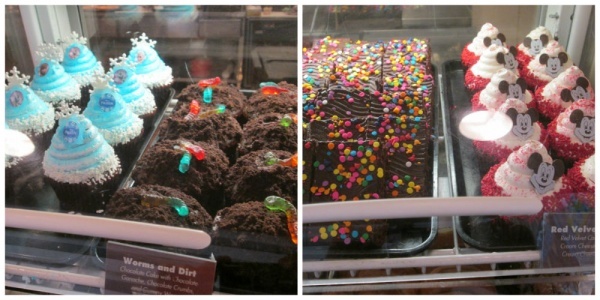 There is a dessert case in which you can pick out your dessert on the spot. My favorite entrée here is the Steakhouse Salad with beef, onions, goat cheese, tomatoes, and pita bread. The dressing is a mustard vinaigrette which is light and refreshing. 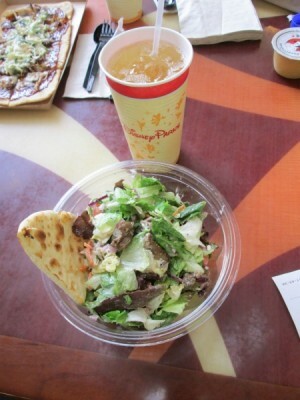 This salad is not just my favorite meal at the Contempo Cafe; it’s one of my favorite quick service meals in all of Walt Disney World! The bowl is quite deep and the portion size is large. My son tried the Smoked Pulled Pork Flatbread. 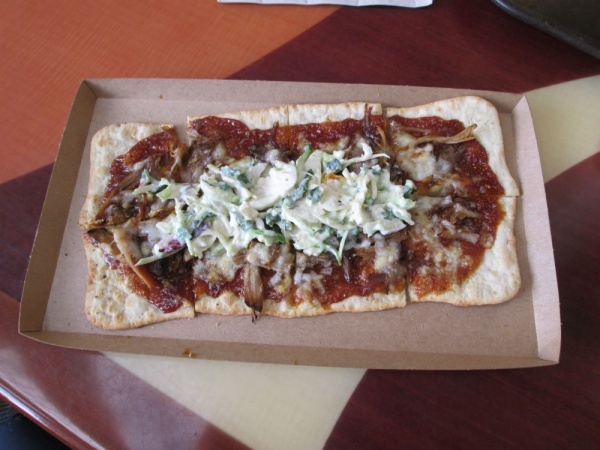 It is a flatbread featuring pulled pork, barbeque sauce, cheese, ranch dressing, and greens. The greens were coleslaw, which made me skeptical of his choice because he won’t touch coleslaw at home. He gobbled up this flatbread with record speed and declared it to be delicious! 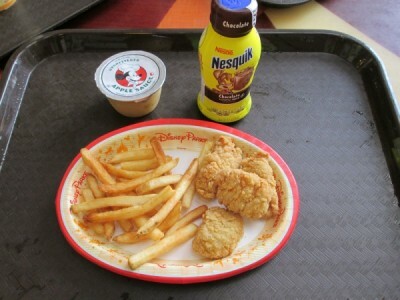 My daughter went for one of her go-to items, a kids meal with chicken nuggets, fries, and applesauce. I have to say that it looked bland to me, but she was happy with her choice. The pastry dessert items were tempting, but it was a hot day and we were all in the mood for ice cream. 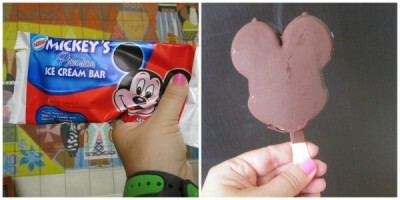 We decided upon Mickey Ice Cream Bars for dessert! 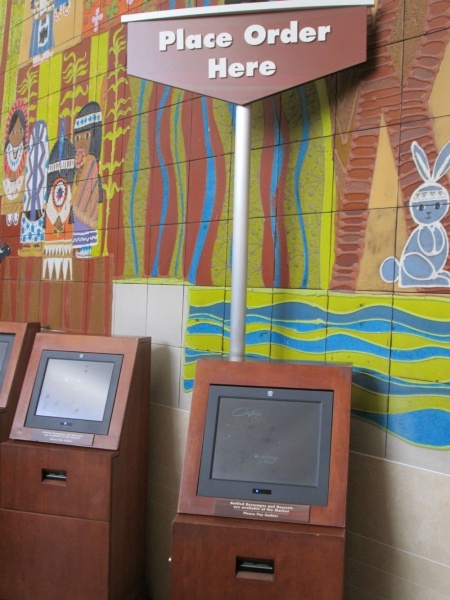 One great tip is that if you want ice cream for dessert, if you purchase it ahead of time, the cast member at the register will stamp your receipt so you can come back for ice cream after you finish eating your entrée. That way, the ice cream will be fresh and cold when you’re ready for it. 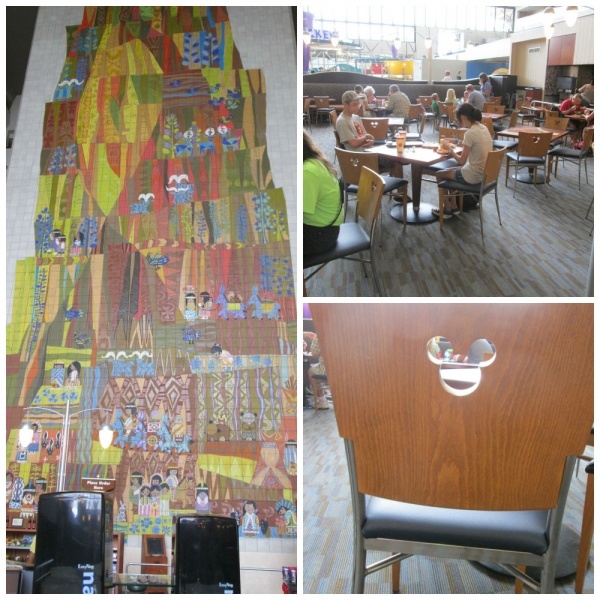 Our lunch at the Contempo Café was a perfect break from the Magic Kingdom and it was a great place to enjoy lunch! What are your thoughts? Do you enjoy dining at Contempo Cafe? 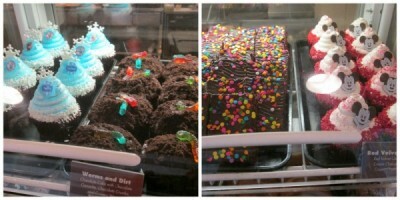 What’s your favorite entree or dessert?